If you want to bring a touch of the beach home with you, look no further than Designer Driftwood vinyl deck flooring by Tufdek™. Featuring a rich grain and the soft tones of sun-bleached wood, Designer Driftwood vinyl decking can complement any deck, patio, porch, or pool surround. This outdoor flooring pattern is perfect for large spaces, and offers a durable deck surface for your entertainment areas. Designed by Tuff Industries, Designer Driftwood vinyl flooring is sure to attract attention, but can also meet the demands of any climate. 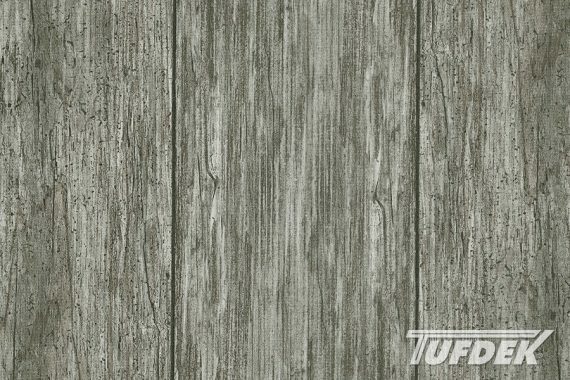 Tufdek™ offers a unique waterproof vinyl decking product that offers the look of driftwood, without the costly upkeep. Perfect for projects requiring a “cooler” color, Tufdek™ Designer Driftwood can match the décor of your family home or summer cottage, or it can keep your feet cool and comfortable as you lounge around your pool…yes, it will even work on pool decks. This Tufdek™ vinyl decking product uses proprietary Aqueous-based inks in combination with a polycarbonate top finish – making our outdoor flooring product look beautiful for your family to enjoy, with clear colors inside an easy-to-maintain package. Designer Driftwood vinyl flooring, like all waterproof vinyl decking products by Tufdek™, is manufactured with close attention to quality and detail. You’ll end up with a fantastic waterproof decking product that is strong, long lasting, and requires only minimal upkeep. Once installed by a qualified Tufdek™ dealer, your Designer Driftwood vinyl deck flooring will be ready to handle anything a busy deck encounters: foot traffic, kids, pets, and all weather conditions. Tufdek™ has created a waterproof outdoor decking product that is meant to last – meaning no fading, peeling, or bubbling. Your Designer Driftwood vinyl flooring is covered by a 15-year warranty. Contact Tufdek™ toll-free at 1-877-860-9333 for more details about this amazing outdoor waterproof flooring product or to find your local Tufdek™ dealer. You can also reach us by email. Tufdek™ Designer Driftwood Vinyl Flooring is assembled by one of North America’s leading PVC roof membrane manufacturers and quality audited by Intertek, an independent third party testing facility.